Local search allows us to find nearby businesses. 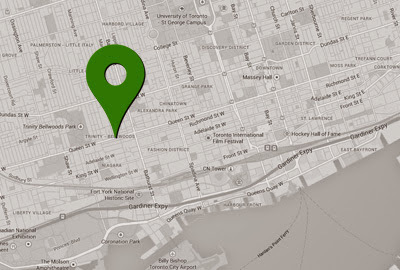 When users add a city or neighbourhood to a search, the results are limited to local companies. With smartphones, the search results automatically take into account your current location, thanks to the geolocation ability of smartphones. Google and other search engines want to give the person seeking the best experience; hence, they provide businesses with the ability to not only add their locations but sometimes also: phone number, hours, website address, etc. Social Media also has localisation for businesses, Facebook, LinkedIn and Google+ have business pages available (free!) to all companies. On these pages, a business can list their location details and contact information as well as communicate with customers. Review websites like Yelp, OpenTable and FourSquare also allow companies to add their information to the listings. It would be impossible to insert the business information to all review and social media websites; pick the ones that matter (start with the ones mentioned above) and make sure your business is listed with the correct information. Why is local search crucial for Small Businesses? Setting up business pages on Google and other sites are free advertising. Some websites like Google, allow for pictures and product listings. These pages also help with SEO (search engine optimisation,) Google places for business and Google+ pages are the most influential on search. Your company offers a better experience when found, and the business gets to own the information displayed. Local search is an essential piece of search engine optimisation for retail stores, doctors, restaurants, bars and even service providers. For businesses that don’t rely on foot traffic such as B2Bs, local search is still as necessary; since suppliers, clients, partners and potential employees will likely be looking to get directions to your office or choose to work with someone local. Making sure your facilities are easy to find can help to build confidence in your business. How to set it up and where? There are three different website groups where a business can add the location, contact details and other information. 1. Search engines, 2. Review websites and 3. Social Networks. Although there are many more websites where your business can be listed, I am focusing on the most prevalent ones. Google is the most popular search engine, and most likely it will continue its dominance for many more years. If you are going to enter your business information in one place, make sure it is on Google. A very distant second search engine is Microsoft’s Bing, and even though it is the default search engine for Internet Explorer and Facebook, Bing has a long way to go to catch up to Google, but people are using it and having your business listed on Bing can only help. IIt only takes a few minutes to add your business address to Google Places for Business. Google then confirms the addresses by mailing you a postcard to that address with a PIN number to verify the right location of your business. Don’t worry; your page will be active right away with a message that verification is pending - once you entree the PIN your page is verified. Once you have the account setup, it is pretty easy to follow the steps for adding your business listing to Bing. Most likely your company is being talked about already in these networks. You can make sure that your business information is correct, and it wouldn’t be a bad idea to check once in a while to read what people are saying about your store and interact with your customers. Facebook and Google+ pages are a must for any business; Facebook for the sheer number of users and Google+ for the SEO advantages. LinkedIn Company Pages are not as useful but having a good presence in that business network can be helpful for future relationships with vendors, employees and possible leads. For each network follow the natural step-by-step process to set up your company page; personal accounts are needed for all three channels before you can work on your business page. Would you like to learn more about how to do all this? Leave me a comment, or use the contact page, I’ll answer your questions. Hello Gustavo, thanks for a very useful and concise article on the subject of local search. I often read your articles and love your straight to the point style. Much appreciated Massimiliano; I try to keep it simple and in everyday language.